The Tasmanian Wilderness area constitutes one of the last expanses of temperate wilderness in the world, including the renowned South West Wilderness. Also, important prehistoric aboriginal sites were discovered here. The sites's natural features have been compared to Fiordland, part of Te Wahipounamu (New Zealand) and Los Glaciares (Argentina). The Tasmanian Wilderniss WHS occupies a large part of Tasmania. 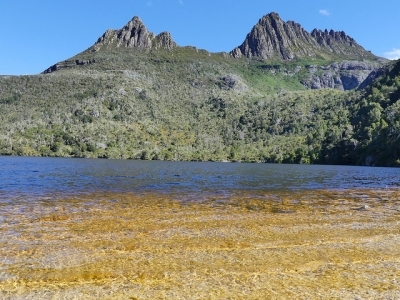 For a daytrip from the Tasman capital of Hobart, Lake St. Clair (part of the Cradle Mountain/Lake St. Clair National Park) is the most accessible option. I rented a car and drove out there in 2.5 hours. It's a fine drive through the island's hilly landscape, with plenty of sheep along the road as well as signboards to watch out for kangooroos, wombats or Tasmanian devils. I arrived at the visitor center at about 11 a.m. There's a 24 AUS dollar entrance fee (per car) that you have to pay there. And you can take your pick among the many walking tracks in the area. I was looking for a hike of about 3 to 4 hours. The one to Shadow Lake fitted nicely, so it seemed. So after having a quick look at the vast Lake St. Claire, I got going. The track is signposted very well. I did not encounter any other travellers, though there were about 10 cars in the car park. You can do hikes that vary in length from half an hour to 5 days, so it will not get crowded easily in a track. After walking for about 45 minutes on a small path through the forest, I suddenly realized that I was not enjoying it. There were trees, trees and more trees around me. Most of them Eucalyptus, common in Australia. No colourful birds, no birds at all except for black crowes. And no mammals either. So I easily convinced myself to turn back and go find something else to do here. On the way out I was already attracted by the sign "Platypus Bay" - the Platypus an animal that I would really like to see. There's a short circular walk that you can do that brings you to the bay where they are often seen. You just have to sit still and be very quiet, the instruction boards told me. Platypus Bay turned out to be a very fine beach at Lake St. Claire. So I sat down at a dead tree trunk, ate my lunch and stared at the water. Supposedly you have to look for a crocodile kind of movement in the water. Unfortunately, I saw nothing move in the half hour that I sat there. At the visitor centre of Lake St. Claire they have journals where each visitor can write down his sightings of wildlife. People had seen wallibies, Tasmanian devils, wombats and echidna. And almost every day a Platypus or two at the Bay. I was not so lucky, and returned back to Hobart with only memories of dark forests. You definitely need more time on the ground and an overnight stay to see any wildlife here. I visited this WHS in January 2018 and spent 4 days in Tasmania exploring by rental car. Of the 8 national parks/state reserves inscribed, I visited Cradle Mountain/Lake St Clair National Park. It is quite a drive on very good condition winding roads to get there. The only stretch on the heritage highway is littered with speed cams so make sure to respect the speed limit or you'll have an unwanted souvenir. To avoid some of the queues I paid the national park pass for my car online and printed it beforehand. Upon arrival at the Cradle Mountain NP Visitor Centre (which closes at 4pm) and huge parking lot, I registered and I was given my day tickets. A very efficient hop on hop off shuttle service is offered (which runs till 7pm). The least popular stop is the one at Snake hill which as the name suggests is the best place to encounter some snakes from the boardwalk. It is worth stopping at the Ranger Station for some information on the park and trails. The UNESCO WHS inscription plaque can be found there but is oddly placed as part of the stone benches - so unknowingly people might be sitting on it! A little walk up the street from here is another metal sign displaying WH status and a quiet trail through small waterfalls which leads to the enchanted walk were we saw rabbits, wombats and lots of parakeets. 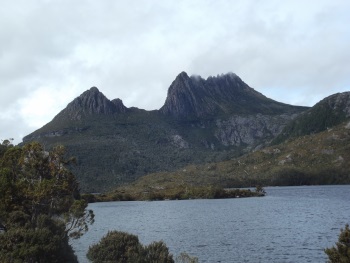 The last stop is at Dove Lake were there are several walks with great views of Cradle Mountain. Arriving in the morning, we opted to walk in a clockwise direction. The iconic views of Cradle Mountain can be enjoyed from all around the Dove Lake Circuit and not only from Glacier Rock, which seems to be the only spot where most tourists gather. The circuit is 6.2km long and if you keep your eyes peeled and keep as quiet as possible, you might be lucky to spot some of the abundant wildlife there is here. We were lucky to spot an echidna, wombats and a tiger snake just from the boardwalk. The northern section called the Ballroom forest was blooming with pink mountain berries and Tasmanian snow gums. For the more adventurous hikers, the trail to the summit of Cradle Mountain is 12.8km (6-8hrs return) and the trail to Cradle lake is a 5.7km circuit. We also ventured to a stretch of the cradle valley boardwalk but turned back after spotting a couple of intimidating lowland copperhead snakes. Apparently from 1st October to 31st May it's booking season and an overland track pass is charged in addition to the park entry fee. To avoid overcrowding, short-term overnight hikers are given specific tracks and accomodation choices. However, when we visited (on a bright sunny day), the only place which was crowded at times was glacier rock. Especially towards the northern sections, there were times were we were practically alone for almost an hour and we really enjoyed the peaceful and outstanding scenery (photo). Tasmania is one of the last temperate wilderness areas in the Southern Hemisphere with pristine habitats for plants and animals found nowhere else in the world, including many threatened species. The glacially formed landscapes are of exceptional beauty and reveal a rich and complex geology - a rich legacy of humanity's interaction with the land dating back to the Ice Age. An important tip when visiting Cradle Mountain National Park is to plan ahead and prepare a packed lunch or stock up your fridge for dinner as there aren't many options after 4pm. The best light on a sunny day is in the late afternoon just before sunset which was around 7pm when we visited. Many Australian tourists came straight to the Dove Lake area by car just to enjoy the view. Since we wanted to see the Tasmanian devil we followed a ranger who was conducting a guided night time walk and managed to spot one lazing about in its burrow. We also saw many possums, kangaroos and an endemic Tasmanian pademelon which come out to feed at night time. Other scenic spots worth visiting (non-WHS) if you have time in Tasmania are the orange lichen-covered granite boulders of the Bay of Fires, the Wineglass Bay Lookout at Freycinet Peninsula and Australia's oldest bridge and delicious scallop pies at Richmond. The heritage highway also offers an easy way to visit Tasmania's 5 inscribed convict sites (as well as several others). 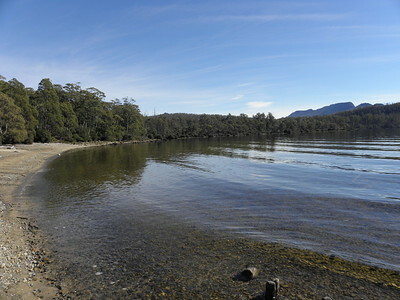 All in all Tasmania is one of Australia's top WHS and nature destinations. Because of the limited public transport in Tasmania I travelled around the island by campervan. This enabled me to see remote areas of the Tasmanian Wilderness, especially at night when most of the wildlife is out foraging. At the Cradle Mountain NP I used the Park's shuttlebuses to reach Dove Lake. Here I saw echidna and wombats, as well as a pair of platypus in the shallows of the lake. In the early morning my van was surrounded by wallabies. From Strahan I took a boat trip up the Gordon River to see the remining stands of Huon Pine in that area. At Lake St Clair I took a ferry to Narcissus Bay at the northern end of the lake. Here there was some interesting mountain scenery (though nothing as dramatic as in New Zealand's Southern Alps). Wombats and echidnas were common here too. In the Southwest NP I visited Lake Pedder and the surrounding mountains. The only Tasmanian Devils I saw were in a reserve near the Port Arthur Convict Settlement. Never did the Overland Track but friends of mine who've done it said that it was grueling yet exhilirating! I did go to Cradle Mountain, which was beautiful. Tasmania is such a jewel of a place! I went to tasmania for a school trip and it was good. we saw everything and the heritage was spectacular. Gorgeous! This must be one of the most beautiful places on the entire planet. The Tasmanians should be very proud of their state. The Overland Track between Cradle Mountain and Lake St. Clair must be one of the finest hikes on Earth. I can't recommend it higher. But, if you do attempt this hike, please be fully prepared. The weather in this part of the world can be absolutely lethal. Oh and also, Tasmania, please STOP THE LOGGING! From "Western Tasmania Wilderness National Parks" to "Tasmanian Wilderness"
Named after individual people: Abel Janszoon Tasman (1603 - October 10, 1659), was a Dutch seafarer, explorer, and merchant.